Wat Khao Suwan Pradit was home to another famous monk of the South. On the top of the hill is a chedi which houses relics of Lord Buddha which were brought here from Chiang Mai. The temple also offers a great view over the bay and the nearby islands. A little bit further along the beach is the point from where the ferries to Ko Samui and Ko Pha-ngan departs. Wat Khao Suwanpradit previously has been call “Khao Lan Temple” located at Ban Thong Mai. Local people believe that at the moutain, there is Yod Khao Father (who is the angle protecting this mountain). Luang Pho Choi, one of southern Thailands’ most revered Buddhist monks, founded this monastery. The 45-meter hilltop pagoda contains Buddha relics brought from Wat Phra Kiat, Hod District, Chiang Mai. From the pagoda, visitors can get a panoramic view of the coast. 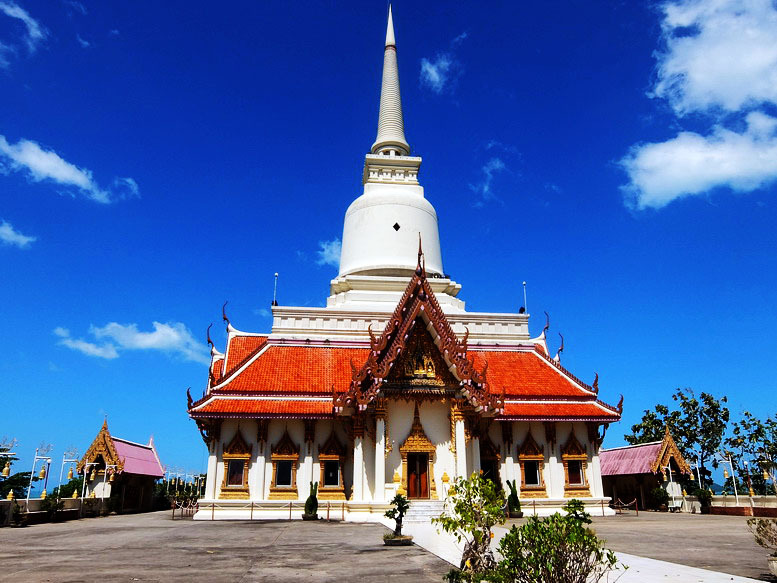 The temple is located approximately 1 kilometer from Don Sak District, along the Suratthani – Nakhon Si Thammarat (Highway no 401).